If there is a singular feature to Dungeon Crawl Classics, the retroclone published by Goodman Games, it is the ‘Character Funnel’. This takes Zero Level player characters—usually four per player—and pushes them through a Zero Level dungeon. Devoid of the abilities and Hit Points that a Class would grant them, a Class is what each of these player characters aspires to and can acquire if they survive the challenge each of them will face in the dungeon. Thus prepared by their terrible experiences they can go onto greater adventures of ever higher and higher Levels. In the meantime, there is the ‘Character Funnel’ in which there is death and danger aplenty, as well as a challenge for the designer, because every has to present the right mix of death and danger if any of the characters are to survive. This is because the characters lack the abilities, spells, and combat acumen that First Level adventurers possess, instead they have to rely upon their luck and their wits. Like most ‘character funnels’, the labyrinth below Nebin Pendlebrook’s pantry consists of a limited number of rooms and encounters—in this case twelve—organised in a fairly straightforward fashion. This fashion is not quite linear as there are a couple of deviations, but on the whole, the layout of the labyrinth is unfussy and uncomplicated. The same cannot be said of each individual room. Each of these is highly detailed, with lots of features to examine and explore, not always immediately, but for the curious and the careful, there plenty of things to find and plunder. Of course, some of this exploration involves some nasty encounters—if only for Zero Level characters—and some quite deadly encounters, including monsters and traps. These will whittle down the number of player characters, ready for the first of two confrontations in the dungeon. There is one which solves the mystery that triggers the adventure and one that solves the mystery that becomes apparent as the dungeon is explored. There is actually quite a lot of background to the dungeon. This is included to help the Dungeon Master develop the events of the dungeon beyond its labyrinthine tunnels. This is in addition to the helpful advice for the Dungeon Master on running each of the various encounters and the staging advice at the end of the scenario. Further help comes in the form of an appendix, a PDF document containing paper miniatures, battle maps, initiative cards, images, and handouts to use when running the adventure. These are all useful tools to add to the adventure. One excellent feature in Nebin Pendlebrook’s Perilous Pantry is the inclusion of the means to cast spells or turn undead. Of course, the characters in the scenario being all Zero Levels means that they do not have access to the spellcasting or other abilities of First Level characters, but their inclusion means that the players and their characters—as well as the Referee—get to preview how each works and what their effects are in the game. Perhaps their use might dictate what their choice of actual Class and career will be at the end of the adventure. It also means that the players and their characters who have access to these abilities—and it should be made clear that these abilities have very limited use—have genuine moments in the scenario where they can be shine and be awesome by using those abilities. This is fine, but what it also means that the players and their characters without access to these abilities will lack such moments to shine. Perhaps it might have been interesting to have included other means of showcasing the abilities available to First Level characters of other Classes, but this may be over-egging the concept. Nebin Pendlebrook’s Perilous Pantry comes as either a forty-two page, 31.19 Mb PDF or a forty-two page, digest-sized book. In the either form, they are done in greyscale, the artwork is decent, and the writing good. It needs a slight edit here and there, but the main issue with the PDF is that it is difficult trying to print it out. Perhaps a printable version could be made available? 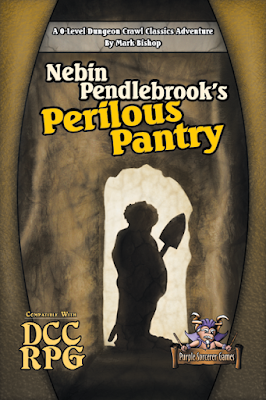 If you looking to try Dungeon Crawl Classics, then Nebin Pendlebrook’s Perilous Pantry is a good choice. It is challenging enough to present the possibility of a TPK—Total Party Kill—but with careful play and a bit of luck, some survivors can make it out again to not only report on the fate of Nebin Pendlebrook, but also claim enough Experience Points to acquire First Level. The dungeon is also simple enough and self-contained enough that the Dungeon Master need not use the full Dungeon Crawl Classics rules, but merely those presented in the Dungeon Crawl Classics Roleplaying Game Quick Start Rules & Intro Adventure, which can be downloaded from the Goodman Games website. Entertaining and engaging, Nebin Pendlebrook’s Perilous Pantry is a delightful ‘character funnel’, whether run as a one-shot or as the start of a campaign. A blog dedicated to reviews of RPGs and their supplements, with an emphasis on Call of Cthulhu and other Lovecraftian inspired games. All leavened with the occasional board and card game review. Eldritch Tales Referee Screen Now Available! BLOG - A new Tekumel Blog about, apparently, actual play.